1. At the Norfolk Broads Cycling Centre you can hire adult and children's bikes, tag-along trailers, child seats and tandems with helmets, locks and pumps if required. Free route maps. The centre is located in the car park at BeWILDerwood off the A1062 between Hoveton and Horning (BeWILDerwood entry not required). The centre is open daily 10am-5pm during school holidays. At other times please phone the centre for full details of opening times. 2. At our BroadsByCycle self-service hire points you can rent adult bikes anytime between 7.00am and 9.00pm every day between March and October. The hire points are outside the Hoveton Visitor Centre, in the car park near the Swan Inn in Horning and at Ludham bridge. There are free route maps available at the Norfolk Broads Cycling Centre and you can enjoy pleasant cycling along quiet country lanes around the Broads - Britain's Magical Waterland - with pubs, cafes and attractions along the way. There is also access to the Bure Valley Cycleway - a 9 mile off-road trail alongside the Bure Valley steam railway. 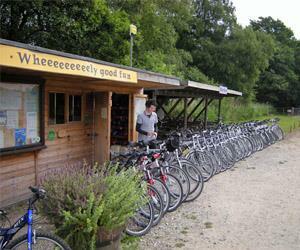 The Norfolk Broads Cycling centre at Bewilderwood is open daily during school holidays from 10.00am to 5.00pm. At other times please book by phoning 07887 480331. The BroadsByCycle self-service hire points are open 7.00am to 9.00pm, every day from March to October. Phone 01603552563 for details and to book. Adults from £15 per day. Under 14s £10 per day. 1/2 day and 2 hour rates available. Take A1062 from Hoveton towards Horning. BeWILDerwood Adventure Park is 1 mile on L.H. side.